[160 Pages Report] The overall contact center analytics market is expected to grow from USD 634.3 million in 2016 to USD 1,483.6 million by 2022, at a CAGR of 15.9% from 2017 to 2022. The contact center analytics tools provide the features of capturing, structuring, and analyzing the data to get a pattern or predict future outcomes. Contact center analytics has proven to be an important solution, as it provides better analysis to enhance the customer experience. The base year considered for the study is 2016, and the forecast has been provided for the period between 2017 and 2022. Customer expectations for superior customer service before and after any purchase have increased tremendously in the past few years. Today, customers have access to various products and sellers online. They select the one that best matches their expectations, which are related not only to the product quality, price, and variety, but also to the customer service before and after a sale. Contact center is the second touch point for customers after a retailer or eCommerce website, and is a crucial element for making a positive or negative impression on the customer. During this research study, major players operating in the contact center analytics market in various regions have been identified, and their offerings, regional presence, and distribution channels have been analyzed through in-depth discussions. Top-down and bottom-up approaches have been used to determine the overall market size. Sizes of the other individual markets have been estimated using the percentage splits obtained through secondary sources such as Hoovers, Bloomberg BusinessWeek, and Factiva, along with primary respondents. The entire procedure includes the study of the annual and financial reports of the top market players and extensive interviews with industry experts such as CEOs, VPs, directors, and marketing executives for key insights (both qualitative and quantitative) pertaining to the market. The figure below shows the breakdown of the primaries on the basis of the company type, designation, and region considered during the research study. The contact center analytics market comprises a network of players involved in the research and product development; system integrator; software and service provider; distribution and sale; and post-sales services. Key players considered in the analysis of the market are Cisco Systems, Inc. (US), Genpact Limited (Bermuda), Verint Systems Inc. (US), 8X8 Inc. (US), Genesys (US), Oracle Corporation (US), Mitel Networks Corporation (Canada), SAP SE (Germany), NICE Ltd. (Israel), Enghouse Interactive (US), Five9, Inc. (US), CallMiner (US), and Servion Global Solutions (India). These Contact Center Analytics Solutions Vendors are rated and listed by us on the basis of product quality, reliability, and their business strategy. Please visit 360Quadrants to see the vendor listing of Contact Center Analytics Solutions. In June 2017, CallMiner expanded its analytics portfolio by partnering with Nuance Communictaions, Inc. This partnership enabled CallMiner to boost its analytics product Eureka with Nuance's Transcription Engine while CallMiner Eureka will power Nuance’s VOC analytics. In Novemebr 2016, Verint Systems Inc. acquired OpinionLab, a customer engagement solutions provider. With this acquisition, Verint has broadened its capabilities in customer Engagement Optimization for listening, analyzing and acting on the VoC across all channels - digital, voice, text and social. In September 2016, o NICE launched EVOLVE WFM, a cloud-based workforce management solution, which brings NICE’s enterprise-class workforce management technologies to the small- to medium-sized contact center analytics market. What are new application areas which the contact center analytics companies are exploring? The overall contact center analytics market is expected to grow from USD 709.5 million in 2017 to USD 1,483.6 million by 2022 at a CAGR of 15.9%. 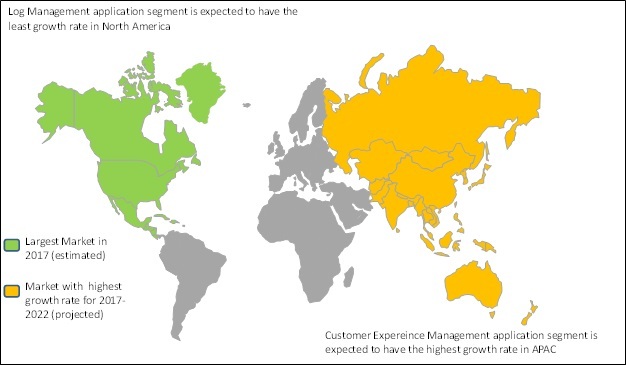 Demand for better customer experience management solutions, proliferation of cloud computing, growing demand for speech and text analytics solutions, and increased compliance requirements are the key factors driving the growth of this market. Contact center analytics are the solutions that provide contact center managers a better way to get actionable insights and recommendations out of customer interactions with the agents. These tools provide the features of capturing, structuring, and analyzing the data to get a pattern or predict future outcomes. Contact center analytics has proven to be an important solution, as it provides better analysis to enhance the customer experience. By utilizing technologies, such as machine learning, Artificial Intelligence (AI), and Natural Language Processing (NLP), contact center analytics solutions have provided analytics results and actionable insights. The contact center analytics market has been segmented, on the basis of component, applications, organization size, deployment model, and industry verticals. APAC is expected to grow at the highest CAGR during the forecast period. Rising disposable income and increasing digitalization have resulted in higher adoption of smartphones and other mobile devices. Further, there is likely to be huge data generation from these devices which would demand technologically advanced analytics solutions to enhance the customer experience at the contact centers and help generate revenues for the different industries. The region is witnessing increasing demand for cloud-based analytics solutions owing to the increasing size of SMEs. As a result, APAC holds a significant share of the overall market. Contact centers can leverage from analytics by integrating and analyzing customer data from multiple channels and utilize generated insights to improve their contact center operations and find new opportunities to engage and serve their customers. Customer experience analytics aggregates customer interactions, transactions, and feedback and agent data to provide an end-to-end picture of the customer journey. It can provide multiple avenues for CEM through customer analytics. Some of the major opportunities include automatically assigning a reason for all customer contacts based on speech, text, desktop, and transaction analytics. Customer journey analytics provides crucial insights by tracking customer’s interactions across multiple channels. Contact center Workforce Optimization (WFO) solution comprises several components such as performance management, interaction analytics, quality management, and workforce management which enable a contact center to optimize their workforce operations including recruitment, monitoring, evaluation, improvement, and motivation. An essential component of a WFO solution include providing agents with the right training and knowledge and deploy them in the right position to facilitate high-quality customer experience. Further, workforce management, a crucial part of WFO, enables contact center managers to forecast and schedule properly for different channels by identifying broken processes and improving employee performance across-channels. Contact center analytics capabilities such as speech analytics enable contact centers in such scenarios by analyzing every single agent contact, either during or after the call. With a speech analytics solution, collections call centers can monitor each and every call to identify risk associated with the content of the conversation. Further, it can be used to prevent sensitive cardholder data from being recorded by identifying such instances and mute call recordings when account numbers, security codes, and other sensitive information is spoken. Another instance includes where Quality Assurance (QA) departments at a credit union can use speech analytics for tracking escalation language. By identifying several different language strings that could indicate an escalated call, analysts can identify the exact language that occurred most often in escalated calls. These insights can then be used as a training opportunity. By identifying some areas for agent improvement, the credit union could work to reduce the number of complaints. What are the upcoming industry applications of the contact center analytics? The high cost of investment and consumer data privacy rules and regulations are the major factors restraining the growth of the contact center analytics market. Companies in industry, such as finance, insurance, public sector, and debt collection have to comply with various regulations, failing which would lead to potentially expensive penalties, including heavy fines and criminal prosecution. Contact centers have tried to reduce their risks through scripting, call monitoring, and call recording, but these do not offer any guarantee or proof of compliance. Standards such as Payment Card Industry Data Security Standard (PCI-DSS) are developed to ensure the safe handling of information and protect customers against identity theft. Contact centers, complying with this standard, cannot store certain portions of sensitive cardholder information even through the most secured possible method. Further, the practice of offshoring has raised the concern among consumers, as companies have increasingly turned to outsourcing customer phone contact and back office processing to overseas companies in an effort to cut cost and boost efficiency. Key players in the market include Cisco Systems, Inc. (US), Genpact Limited (Bermuda), Verint Systems Inc. (US), 8X8 Inc. (US), Genesys (US), Oracle Corporation (US), Mitel Networks Corporation (Canada), SAP SE (Germany), NICE Ltd. (Israel), Enghouse Interactive (US), Five9, Inc. (US), CallMiner (US), and Servion Global Solutions (India). These players are increasingly undertaking mergers and acquisitions, and product launches to develop and introduce new technologies and products in the market. *Details Overview, Strength of Product Portfolio, Business Strategy Excellence, Recent Developments, Key Relationships Might Not Be Captured in Case of Unlisted Companies.